This beautiful garter set is quality hand made from a licensed cotton Falcons print, it is not an officially licensed product. The wider keepsake garter is made with black satin on white organza and features a fabric applique I made from the fabric. The thinner armband garter is made with the best cut of the licensed fabric. 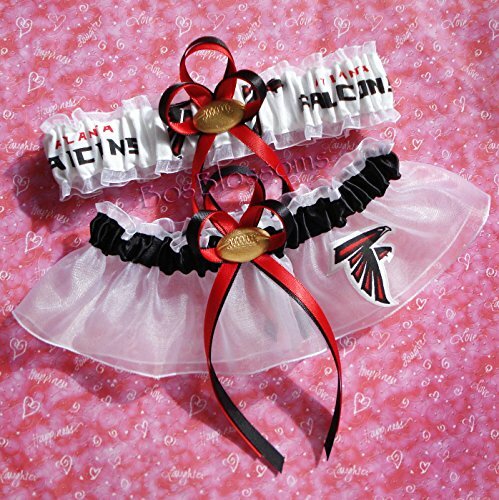 I added my signature team color bows and football charms. Both garters are professionally finished in a French seam so there are no raw edges and the ribbons have been sealed to prevent fraying. Especially for brides, I've also included my "Something Blue" bow to the inside of the wider keepsake garter for extra good luck on your wedding day! View More In Lingerie, Sleepwear & Underwear.